The LG 50LB5900 keeps things simple with its 1080p LED backlit display, upgraded 120Hz refresh rate, and scaled back Smart TV platform. As a step down from the LB6100 there are only 2 HDMI inputs, also a few picture settings and sound settings have been left out, and the available sizes in the series are different. This one is designed for those looking for a some respectable picture technology but without Smart TV driving up the price.The 50LB5900 sells for around $525. The 50LB5900 has a nice bright, vibrant display and still does a nice job of keeping the cost down. There is some darker shadowing around the corners of the panel if you use it at an extremely high contrast setting. The biggest upgrade to the picture and TV is the 120Hz refresh rate which is normally reserved for higher priced models. It really helps to reduce background blur and slow processing issues and since the LB5900 is made in larger sizes, it's a smart move. Since it is a backlit TV we see good levels of brightness and contrast. Light flow through is another strong point in the picture and helps to add depth to the image. Color and contrast are the best when viewing from front and center, more on that below. Colors accuracy is bright and natural after calibration. You are going to see a very similar picture to last year's similar LN5700. 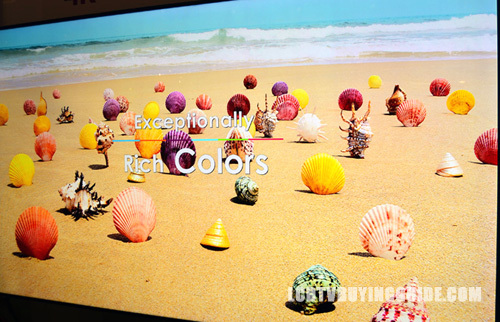 This LED direct-lit LCD television has good off angle viewing performance for an value LED TV. Compared to many LED direct lit models the 50LB5900 still looks good at angles around 30 degrees off center where the other will start to have the contrast degrade at 20 to 25 degrees. The top tier LG TVs this year feature an IPS panel that we have seen to really improves side angle viewing. If you normally have to deal with wider viewing angles, looking there would be a good option. Our favorite choice is the Cinema setting with Clear Voice II setting enabled with the level set at 3. The Standard setting Clear voice II enabled was a close second. Overall we rate the sound quality of this TV as excellent and a high point and it will be especially useful on a TV of this size. It is better than the other manufacturers we've tested as well by a long shot. The position of the speakers at the bottom back of the TV adds most of the overall depth but we believe it is well worth it to have good sound from the TV. These minimalist TV designs are often used in spaces without home theater systems, so decent sound quality is important. 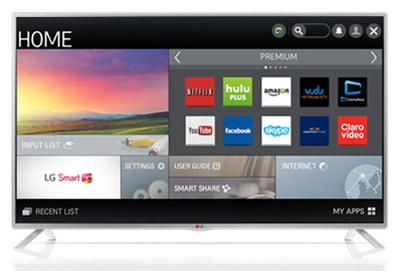 The LG 50LB5900 has a nearly frame-less design with brushed silver bezels measuring in at around half an inch. 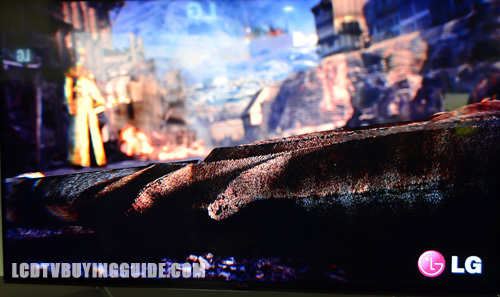 The bezels are not as thin as some of the higher tier models, but they still look great. It also have the 'v' shaped two legged stands we are seeing in many designs this year. They look nice and don't demand much attention, but the width can be a concern. Some TV stands don't have the width, making a wall mount necessary. Keep that in mind. The depth of the panel is about 2.2 inches at the deepest part to accommodate the speakers in the cabinet. The overall design is attractive yet low key with the nearly frameless picture being the highlight. The 50LB5900 sells for around $525. What you get is an overall attractive looking TV, a great/bright picture for the price, and better than most sound quality. Not too shabby. Downsides like side angle viewing, and some shadowing around the corners of the screen, only 2 HDMI inputs, lack of the IPS panel, and minimal Smart TV features don't hurt the value here. Just make sure you have other options for content streaming if this is going to be part of the home theater. Competition comes from the Samsung UN48H5500 that has an extra inch of screen space for around the same price. Dimensions without stand: TV without stand: 44.4" x 26.0" x 2.2"
TV with stand: 44.4" x 27.9" x 10.0"